Longtime activists engaged in solidarity organizing with indigenous groups offer action steps and best practices for non-Native supporters. 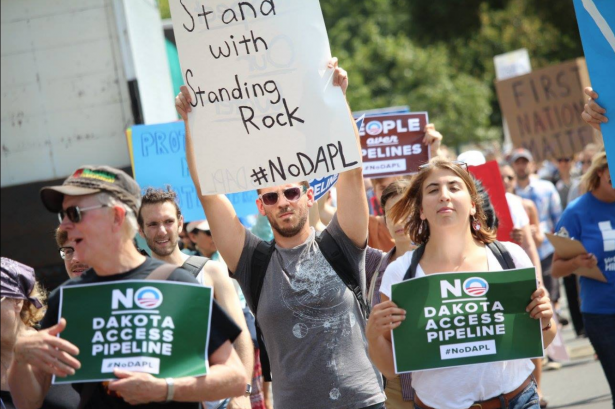 A month after President Obama told the Army Corps of Engineers to pause construction on the Dakota Access oil pipeline, the Standing Rock Sioux and those supporting them still find themselves in a dire struggle to protect their water and land. With winter approaching, the 300 tribes that are now represented at the Camp of the Sacred Stone in North Dakota are preparing for a lengthy battle. In their effort to protect water, life, ancestors and future generations, indigenous peoples are also demanding that corporations, the U.S. government, and settlers respect the treaties and indigenous self-determination. This is widening an existing dialogue and expanding ties of solidarity to include more of us who are of white European descent occupying indigenous land. As support for those at Standing Rock grows, it is important that allies also confront the fundamental questions of what it means to live on stolen land and how to transform colonial relations in a way that creates a viable and just future for all communities and the planet. After almost a decade of engaging in request-based, volunteer solidarity organizing with indigenous groups fighting relocation in Black Mesa, Arizona due to coal mining, we have learned and honed a list of action steps for non-Native individuals just getting involved, as well as a set of best practices for activists already working on other organizing efforts. As people of European descent who benefit from both white privilege and settler privilege, we understand that our work and writing is most effective when it is developing and acting upon a mutual stake in decolonization. This means focusing on the responsibilities specific to our position, which is inherently different from that of indigenous and non-Native people of color. Nevertheless, their organizing, along with much activist scholarship — some of which is linked to below — has helped inform this list of action steps and set of best practices. 2. Know your family’s history. How did your family end up in the United States? Was it through a colonial process in another country? If your ancestors are from a colonizing country, what was your family’s connection to land, spiritual traditions, economies, etc., before that country began colonizing other places? Does your family own land in the United States? If so, how did they come to acquire it? 3. Learn together. Encourage learning that is personal, emotional, spiritual, embodied and communal. Host reading groups and discussions that build an understanding of settler colonialism and your community’s relationship to it that is tied to indigenous solidarity. Roxanne Dunbar Ortiz’s “An Indigenous Peoples’ History of the United States” is an enormously helpful place to start, and there are numerous resources, such as the book “Unsettling America,” the website for Black Mesa Indigenous Support, the Colors of Resistance archive, the journal Decolonization, the No One Is Illegal network, queer indigenous studies, critical indigenous studies and more. 4. Ask permission. Asking permission fundamentally shifts the entitlement inherent to the settler experience. Cultural appropriation is an extension of genocide, forced removals, and land theft, as settlers take what does not belong to them as if it is rightfully theirs. This can be countered by asking permission to be on indigenous peoples’ traditional lands. This practice can be extended in a variety of ways and open up new modes of relating and relationships. As one of the first steps of planning, ask permission for any gatherings, marches, etc., from an indigenous representative of the land you are on. Invite them to collaborate in planning around gatherings, conferences, actions, and campaigns for justice work on their traditional homeland. Be open to the work shifting because of such collaboration. 5. Know where your water, heat, electricity and other resources come from. Lands that were relegated to indigenous use under the reservation system often because of their perceived barrenness are now resource colonies for the settler state. Indigenous communities in the United States are among the hardest hit by the negative impacts of climate change because of the extractive projects and processing that take place on their lands. Coal mining and burning, uranium mining and copper mining are just a few of the extractive projects that leave toxic legacies for generations to come. The profit from extraction on Native lands is rarely returned to the community that has paid the cost in destruction of lands and sacred sites, damage to health, and devastation of local economies and lifeways. 6. Take responsibility for Christian privilege/Doctrine of Discovery. If you’ve grown up in Christian culture, you may be unaware of all the ways that Christianity is culturally dominant in the United States. Work with your faith community to raise awareness about the violent legacy of Christian hegemony and move resources to shift power. If you are part of a Christian denomination that has not yet repudiated the Doctrine of Discovery — the theological justification for the theft of indigenous land — start or join a movement to do so. Challenge the notion that the settler church was divinely ordained within your church community. Start conversations about saints or lauded leaders of faith who were directly responsible for conquest. Learn how your church acquired its land and whose land it was originally. Learn the history of your denomination’s relationship to conquest. Consider that within Christian traditions there are built-in practices for atonement and reparations. Get creative with your spiritual community about what atonement and reparations might look like. If it is possible, try and connect with the indigenous tribe or nation in your area to work on this. The Christian and Catholic Churches are incredibly well resourced not only in cash but also in land. Many, if not all, indigenous-led movements across Turtle Island — the indigenous term for North America — call for return of land to indigenous stewardship. How can the church leverage its many resources in solidarity with indigenous-led efforts for land return? There is a new project in California that is working for the return of urban land to indigenous stewardship. Could your church start a conversation about putting land in trust and working with a local indigenous group to steward it? 7. Engage in local struggles and build relationships. There are ongoing indigenous-led struggles for land and self-determination taking place all over Turtle Island. Not all indigenous spaces and organizations are looking for outside support, but many are. Educate yourself on this history of the area and current struggles. Reach out and take principled and accountable action by centering relationships in your work. The work will often be request-based and/or take on various forms of asking for permission, seeking guidance and input. This is a nuanced dance of taking initiative while ensuring there is guidance and the work upholds, not undermines, community self-determination. Your participation in decision making and giving input should be determined by the indigenous people you work with and will depend on the specific goals. For example, an indigenous community addressing its own tribal government has different objectives and requests from non-Native people than if cross-community power is being built to challenge federal and or state policies, energy policy, corporate power, etc. 8. Work for repatriations of land, upholding treaties, and funding Indigenous-led struggles and efforts for land return. This entails supporting Standing Rock, and other indigenous-led struggles in your region, building power to force the state to respect treaties, and doing creative fundraising campaigns like door knocking for reparations, as members of Resource Generation did in the Bay Area in solidarity with Poor Magazine’s “Stolen Land and Hoarded Resources Tour.” Read more here. While these are helpful tips for individuals entering the sphere of solidarity work, there are also things activists already engaged in other organizing efforts can do to amplify indigenous-led struggles or incorporate a decolonial analysis into their work. It begins with incorporating an analysis of settler colonialism into all of your organizing work. Settler colonialism is the kind of colonial control that exists in “settler states” like the United States, New Zealand, Australia, Israel/Palestine, Canada, Argentina and other countries. It incorporates elements of external colonialism — in which a colonizing power exports indigenous peoples (as slaves or laborers), resources, knowledge, plants, metals, and/or animals to increase the wealth of the colonizer — as well as internal colonialism — which is marked by the violent management of an underclass of people and lands within the “domestic” borders of the imperial nation. So, when Europeans began colonizing what is now known as the United States, settlers came for good — not just to take things and return to an imperial center based in Europe. This is why scholar Patrick Wolfe called settler colonialism a process of “destroying to replace.” It’s our responsibility as settlers to work to dismantle the settler colonial project. Here are our tips — based on research and experience — for how to do just that, while also continuing your organizing work in other areas. If your primary area of organizing is around the environment, recognize that indigenous cultures and lifeways are deeply tied to land, and most contemporary indigenous-led struggles center around access to land or land return. If you engage in environmental work: Consider how the environmental framework of land (or wilderness) as separate from people is an inherently colonial mindset that pits environmentalists not only against labor but also indigenous people, whose lifeways are inseparable from land. If you engage in climate justice work, recognize the ways that indigenous communities have been disproportionately impacted by extreme extraction and climate chaos, as well as how they are resisting. Globally, indigenous communities are living as frontline blockades against extreme extraction. If you engage in anti-racist work, consider doing the work of understanding settler colonialism as a structure and logic distinct from racial capitalism (although interlocking) that is defined in terms of self-determination rather than being solely rights-based. A stance of self-determination signifies that indigenous nations pre-date the existence of the United States and aren’t always looking for recognition from the colonizing force. Rights and “equality” frameworks are most often based on the idea of the individual as the social actor and view equality under the law for all individuals as the end goal. Many indigenous frameworks don’t fully fit this and are centered more on the ideas of the collective (nation, tribe, people), as opposed to the individual. They also prioritize responsibility (to land, and future generations) as opposed to rights. If you engage in labor justice work, familiarize yourself with the history of exploitation of indigenous labor in this country and consider ways in which your work for just workplaces may invisibilize the original inhabitants of the land your workplace occupies. Roxanne Dunbar-Ortiz’s “An Indigenous People’s History of the United States” and Andrés Reséndez’s “The Other Slavery” are good places to start. If you are involved in queer and trans organizing that isn’t yet connected to two spirit/Native queer and trans perspectives and movements, learn from and build with queer and/or Two Spirit Native organizers, cultural workers and scholars. Learn the history of non-Native (particularly white) LGBTQ appropriation of indigenous alternative sexualities, genders and kinship structures. The article “Settler Homonationalism” by Scott Morgensen is a great place to start. Envision and enact queer and trans liberation that is anti/decolonial. If you engage in food justice, or permaculture, herbalism, building alternative economies, and more broadly alternatives to capitalist institutions and modes of organizing reproduction and social life, familiarize yourself with the existing alternatives indigenous people have maintained through surviving, resisting, adapting and decolonizing. Consider the potential for connecting your work to questions of land and unsettling settler desire. As Scott Morgensen explores in the essay “Unsettling Settler Desire,” the desire to replace Native peoples and inherit their land, lifeways, alternative economies, spiritualities, modes of kinship and sexuality runs deep in settler society and permeates various alternative and radical subcultures. These desires for connection to land and land-based practices are often seen as a much needed antidote to the disconnection inherent in settler society. If, however, these connections and practices aren’t cultivated in relationship to indigenous peoples’ struggles to maintain their connections, responsibilities and traditions, then the forms of connection settlers are fostering can replicate “settler desire” and further entrench colonialism. For non-Native people, walking a path of decolonization is the work of envisioning and enacting reciprocal relationships. Through this we can be humbled. We hold discomfort, knowing it is part of our work and our process of rekindling our dignity and interconnectedness. We can work to stop violence and environmental degradation. We can organize to build our communities’ capacity for self-determination, while struggling alongside indigenous communities as they maintain their responsibility to their homelands and future generations. We can shift entitlement and the normalizing of theft, as well as the narrative of “disappearing Indians” — the dominant colonial story that says indigenous peoples, lands and lifeways are inevitably disappearing as part of the natural passing of time. It is the narrative that relegates all things indigenous to the realm of history. We can move away from Western, colonial modes of existing as we restore traditional economies and modes of relating, community to community and nation to nation. Moving towards decolonization allows us to reckon with the violence of our collective inheritance and commit to healing, restoring and transforming our present, so as to ensure that we have a viable and liberatory future. Berkley Carnine is a queer, writer, teacher, organizer of European descent. They teach activist themed courses at Northern Arizona University, do solidarity organizing with Black Mesa Indigenous Support, and Showing Up for Racial Justice, and work to build queer community in smaller cities/ towns. They're working on completing their first novel. Liza Minno Bloom is an educator and organizer of Slovak and Anglo descent. She teaches gender studies at Georgian Court University, and organizes with the Black Mesa Indigenous Support Collective and the Racial Justice Project (in Asbury Park, NJ). She parents a small, magical, revolutionary human. May I print some of these off for a teach-in and phone-rally I am hosting on campus tomorrow? It is a great tool that I know will play a powerful role in our action. this please let me know. global decolonization, human liberation, and protection of Mother Earth. Hi Felicity, thanks for your interest in sharing this content. We operate under a Creative Commons license, which means you are free to do so. We only ask that you cite the authors’ names and Waging Nonviolence as the original source of publication. this is an amazingly comprehensive approach to not only learning ways to support, e.g., the Standing Rock Sioux, but training minds to understand just how narcissistic the ‘settler’ colonization perspective of falsely assuming land entitlement privileges that is. I love that you’ve included the two spirit trans queer perspective [such an amazingly beautiful non-judgmental ideology our indigenous peoples had before organized religions destroyed what is sacred to all humans; the right to live happy and free from judgement]. The world will be a better place because of your teachings. Thank you Berkeley and Liza. Thank you for writing this great article. Everyone should read it. I am mixed-part Cowlitz/Nisqually & mostly white.. Thank You to the Earth Protectors. The truths that you speak are powerful. Your nonviolent stance is refreshing and inspiring. My Spirit stands with you. My Heart prays for the success of your vision. May your journey Be Blessed. Thank you for this sorely needed work. I call myself a Buddhist and have been planing on returning to SE Asia to go deeper into Buddhism—but keep making excuses for staying here. I’m not sure how, but I think I need to Be Here Now. Those of my generation and ilk will recognize that book from the 70’s. It was a kind of Bible for us. We need to bring our years of experience and skill acquisition to this struggle, to be true to who we are and what we hope to leave after this lifetime passes for us. Thanks for the insight. I was interested in coming to Standing Rock until I read this divisive article. Strategically speaking, this is fundamentally a Constitutional land rights issue, and requires no such academic anthropological idealism to peacefully resist the construction of the pipeline. I respect those who hold these views and I agree with many of them. However this is a very divisive basis for a land rights protest. It will likely fall apart unless the protest is re-organized around the unifying principles of the U.S. Constitution. To put it academically, this peaceful resistance will be most successful if it is re-organized for a philosophical victory in the sphere of the dominant culture – not because identity politics is wrong, but because it lacks popular support in the minds of the most passionate defenders of American freedom & Constitutional land rights. Cheers, & good luck! Hi, we are in Coeur d’Alene Idaho and thinking of coming to camp with you at Standing rock from Dec 20th through the 26th or so. I was unsuccessful at emailing you. We are working on getting together some supplies to bring also. Please let us know what you need the most in hopes that we may be able to supply some of your needs. Much love and thanks to you all.